Each year I try to pray about a theme for the year. Usually it is just one word but in this case it will be a general word applied in a few forms. 2017 was a tough year for me. I was hurt by people I thought I was closer to. Finances were tight (but God is providing all our needs.) 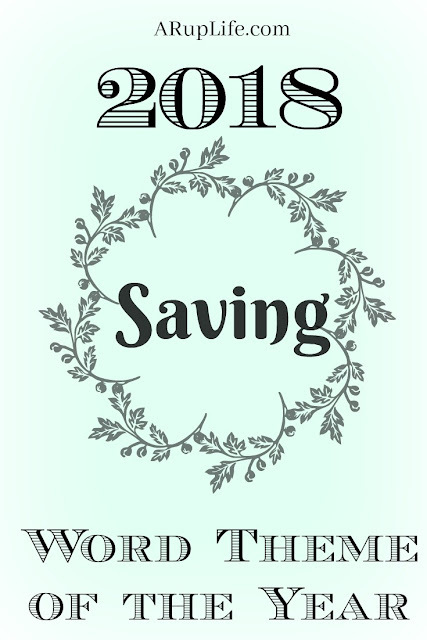 So I was thinking and praying for a theme and the word SAVING kept coming to mind. God has put on my heart that I need to share the gospel more in 2018. I'm 41 and basically that means that I'm on the second half of my days if I were to live to 80. I want my days to count for the Lord. I want to see my friends and family know Jesus and the hope that he gives. I honestly wouldn't make it through this crazy life without Him. With my husband experiencing large layoffs each year for the last few years it has been stressful. It is hard to plan ahead for these events but my financial goal to get some sort of savings to have for emergencies like a layoff. This means we will be cutting back on everything but it is necessary. This might sound odd but I plan to really cultivate relationships that mean the world to me. My husband, kids and my parents are at the forefront. Then siblings and friends. I want those I care about to know I care about them. I am hoping to be a blessing to others who are having a hard time. Without going into too many details I just feel like God laid a big burden on my heart and I hope to be able to help others. Did you choose a One Word Theme for 2018? If so I'd love to hear about it in the comments! This book sounds awesome and delicious!